Lagavulin's aroma has often been compared to that of Lapsang Souchong tea, with hints of sherry and vanilla. Long fermentation, distillation and maturation together ensure that Lagavulin develops its intensely rich, peaty character. A spirit that likes to take its time: savour it slowly. Lagavulin is the biggest, richest, and most intensely flavoured Islay Single Malt Scotch Whiskies. 2015 Silver Outstanding Medal Winner - International Wine & Spirits Competition. Intense, peat rich, sweet and salty. Best enjoyed from a traditional whisky glass, neat or with a little still water. Aged in oak casks for at least sixteen years, with massive peat-smoke but also offering a dryness that turns it into a truly interesting dram. A perfect gift for lovers of peaty and powerful whiskies. Lagavulin is one of the smokiest and most intense whiskies in the world. Since 1816. Lagavulin Single Malt Scotch Whisky has been made in a picturesque huddle of building on Lagavulin Bay looking onto Dunyvaig castle. Revered by connoisseurs and experts, Lagavulin is known as "the king of Islay". It is an 'essential' Scotch Whisky that any connoisseur or enthusiast must have in their collection; one of the world's favourite Malt Whiskies. On the nose, this full bodied Single Malt has intensely flavoured, peat smoke with iodine and seaweed and a rich, deep sweetness. The palate has dry peat smoke fills the palate with a gentle but strong sweetness, followed by sea and salt with touches of wood. Its finish is long, elegant peat-filled finish with lots of salt and seaweed. A much sought-after Single Malt with massive peat-smoke that's typical of southern Islay - but also offering richness and a dryness that turns it into a truly interesting dram. 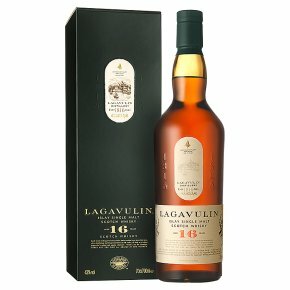 The 16 year old has become a benchmark Islay dram from the Lagavulin distillery. Best enjoyed from a traditional whisky glass, neat or with a little still water. A gift for all occasions for lovers of peaty and powerful whiskies.